The main function of the emergency explosion-proof light is to prevent explosion. Such light is usually installed in specific working places, such as explosive warehouses or gas stations in petrochemical industry. Due to the requirements of special environment, the quality must be paid attention to when choosing the emergency explosion-proof light. The attentions for selection of the explosion-proof light are introduced as follows. In spite of the large number of brands and styles, the basic principle of the light shall be understood first before selecting, so that the detailed issues can be noticed during the selection. The explosion-proof performance is the basic criterion for light quality. The performance, especially the quality of the light casing, shall be considered as the light is used in different environment. The casing must have excellent explosion-proof performance, so that it will not cause explosion of the light due to the external environmental factors. Besides, LED shall be the best choice, as its soft light will neither harm eyes nor affect the normal working. 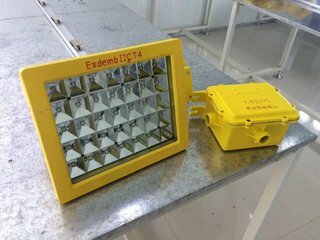 There are different grades of emergency explosion-proof light, which shall be decided based on the specific environment. The shade of most lights is made of armored glass that is rigid to ensure the normal working of the light and prevent any dangerous incident. Due to the special requirement, the suitable grade of emergency explosion-proof light shall be selected for the suitable environment, so as to ensure its safety.